The StuG III Ausf. G is a German tier 5 tank destroyer. Este vehículo entró en combate por primera vez en Francia en 1940. Se fabricó sobre la base del Pz. III en varias modificaciones hasta 1945. En 1944, 9346 de estos cañones autopropulsados habían destruido unos 20 000 vehículos enemigos. Algunos vehículos estuvieron en activo hasta 1967 y fueron desplegados en la Guerra de los Seis Días por algunos países árabes contra Israel. It is exceptionally maneuverable, being based on the Pz.Kpfw. III chassis, and can reach its top speed very quickly. While its stock cannon is powerful against equal-tier opponents, it is rendered useless against anything past tier 6. 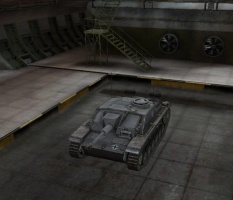 However, once upgraded with the 7.5 cm StuK 42 L/70, the StuG III can deal significant damage to higher-tier vehicles. It is easy to fall into the trap of thinking you're a medium tank with the StuG III's rapid acceleration and high maneuverability, but you will soon learn that you can not take hits like a medium tank. 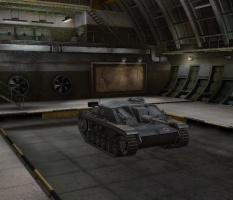 In fact, the StuG can easily die even to tier 3 opponents if they find a way to attack its sides. Even so, experienced players will enjoy running the "StuG life" in this powerful sniper. The StuG III Ausf. G leads to the Jagdpanzer IV. Reasonable front armour that can bounce shots if they hit the sloped portions. The StuG III is an absolute nightmare to opponents if used correctly. It can be both a close combat unit with the inaccurate, hard hitting 10,5cm, or can be an excellent sniper with the 7,5cm L/70. The 10,5cm can be excellent for taking out lower tiered enemies in one shot, but it is not useful against higher tiered tanks. The true strength of the StuG lies in its insane camo and sniping abilities. Therefore, it is highly recommended to use the 7,5cm and to buy a camo net. With the Tank Gun Rammer and the Enhanced Gun Laying Drive along with 100% crew with camo and repair as secondary perks combined with hiding in a bush, this tank is virtually invisible, even when firing. Adding binoculars to further increase sniping ability is recommended. Sniping from afar, you'll often get many opportunities at the sides and rears of tanks. Even against many tier 7 tanks, the 7,5cm gun will still be able to defeat its targets frontally. Being based on the Panzer III's chassis, the StuG III can dart around the battlefield. Use this speed to stay far from combat and relocate efficiently. Use your gun to take out the tanks your allies are having trouble with; your gun's high penetration can shear through nearly any tank if aimed correctly. If the tables turn on you and there's nowhere to run, don't be afraid to engage in close-quarters combat, since your high maneuverability can keep up with a flanker. Even so, your low armor and HP will be your bane, so in general, keep to sniping. Care must be taken when firing with this vehicle, as it has a very low ammunition capacity of 36 rounds. Coupled with its high rate of fire and low damage per round, running out of ammunition is a very real possibility. Important to note is that in contrast to the StuG III's good forward acceleration and maneuverability, its reverse speed is very slow, a problem when trying to move back from enemy fire. Make sure you have a well-defended position with an escape route, otherwise your enemies will be very happy to pay back what you've done to them. The 7,5 cm PaK 39 L/48 and 10,5 cm StuH 42 L/28 guns carry over from the Hetzer, but they're too heavy for the stock suspension. If you played the Pz.Kpfw. III Ausf. A or the Pz.Kpfw. IV previously, the Maybach HL 120 TRM engine will already be unlocked as well as the FuG 7 radio. Research the upgraded suspension first for additional weight capacity and a whopping 7 deg/s increase to traverse speed. The 7,5 cm doesn't have enough penetration to deal with higher tiered opponents, so install the 10,5 cm howitzer and use HE ammunition. Research the 7,5 cm L/70 gun for superior firepower. It's recommended that you research the suspension and engines first. 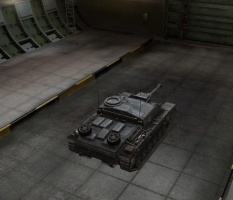 This will allow you to outmaneuver most tanks on your tier, be it in order to flee, or to keep them in front of you during a close range dogfight. After the suspension and engines are mounted, you should head towards the L/70 for higher penetration and accuracy. Until this high-performance weapon is available, you should consider using the 10.5cm howitzer. The Sturmgeschütz III (StuG III) assault gun was Germany's most produced armored fighting vehicle during World War II. It was built on the chassis of the proven Panzer III tank. Initially intended as a mobile, armored light gun for infantry support, the StuG was continually modified and widely employed as a tank-destroyer. The Sturmgeschütz III originated from German experiences in World War I, when it was discovered that during the offensives on the western front, the infantry lacked the means to effectively engage fortifications. The artillery of the time was heavy and not mobile enough to keep up with the advancing infantry to destroy bunkers, pillboxes, and other minor obstacles with direct-fire. Although the problem was well-known in the German army, it was General Erich von Manstein, who is considered the father of the Sturmartillerie, that saw the solution. The initial proposal was from (then) Colonel Erich von Manstein, and submitted to General Ludwig Beck in 1935, suggesting that Sturmartillerie ("assault artillery") units should be used in a direct-fire support role for infantry divisions. On June 15, 1936, Daimler-Benz AG received an order to develop an armored infantry-support vehicle capable of mounting a 75 mm (2.95 in) artillery piece. The gun mount's fixed, fully-integrated casemate superstructure was to allow a limited traverse of a minimum of 25° and provided overhead protection for the crew. The height of the vehicle was not to exceed that of the average man. Daimler-Benz AG used the chassis and running gear of its recently designed Pz.Kpfw. 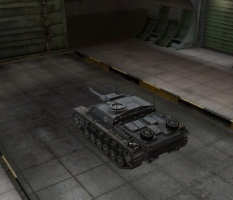 III medium tank as a basis for the new vehicle. Prototype manufacture was passed over to Alkett, which produced five examples in 1937 of the experimental 0-series StuG based upon the Pz.Kpfw. III Ausf. B. These prototypes featured a mild-steel superstructure and Krupp’s short-barreled 75 mm StuK 37 L/24 cannon. This model was known as the Sturmgeschütz Ausführung A. While the StuG III was considered self-propelled artillery, it was not initially clear which arm of the Wehrmacht would handle the new weapon. The Panzer arm, who was the natural user of tracked fighting vehicles, had no resources to spare for the formation of StuG units, and neither did the infantry branch. It was agreed, after a discussion, it would best be employed as part of the artillery arm. The StuGs were organized into battalions (later renamed "brigades" for disinformation purposes) and followed their own specific doctrine. Infantry support using direct-fire was its intended role. Later, there was also a strong emphasis on destroying enemy armor whenever encountered. As the StuG III was designed to fill an infantry close support combat role, early models were fitted with a low-velocity 75 mm StuK 37 L/24 gun to destroy soft-skin targets and fortifications. After the Germans encountered the Soviet KV-1 and T-34 tanks, the StuG III was equipped with a high-velocity 75 mm StuK 40 L/43 main gun (Spring 1942) and later, the 75 mm StuK 40 L/48 (Autumn 1942) anti-tank gun. These versions were known as the Sturmgeschütz 40 Ausführung F, Ausf. F/8, and Ausf. 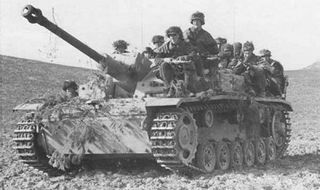 G. When the StuG IV entered production in late 1943 and early 1944, the "III" was added to the name to separate it from the Panzer IV-based assault guns. All previous and following models were thereafter known as Sturmgeschütz III. Beginning with the StuG III Ausf. G, a 7.92 mm MG34 could be mounted on a shield on top of the superstructure for added anti-infantry protection from December 1942. Some of the F/8 models were retrofitted with a shield as well. Many of the later StuG III Ausf. G models were equipped with an additional coaxial 7.92 mm MG34. 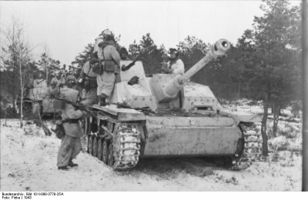 The vehicles of the Sturmgeschütz series were cheaper and faster to build than contemporary German tanks; at 82,500 RM, a StuG III Ausf G was cheaper than a Panzer III Ausf. M, which cost 103,163 RM. This was due to the omission of the turret, which greatly simplified manufacture and allowed the chassis to carry a larger gun than it could otherwise. By the end of the war, 10,619 StuG IIIs and StuH 42s had been built. A StuG III destroyed in Normandy, 1944. This vehicle likely suffered a catastrophic internal explosion. Overall, Sturmgeschütz-series assault guns proved very successful and served on all fronts as assault guns and tank-destroyers. Although Tigers and Panthers have earned a greater notoriety, assault guns collectively destroyed more tanks. 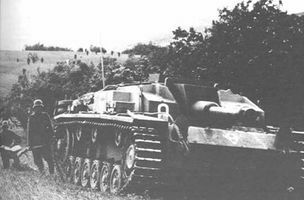 Because of their low silhouette, StuG IIIs were easy to camouflage and a difficult target. Sturmgeschütz crews were considered to be the elite of the artillery units. Sturmgeschütz units held a very impressive record of tank kills: some 20,000 enemy tanks by the spring of 1944. As of April 10, 1945, there were 1,053 StuG IIIs and 277 StuH 42s in service. Approximately 9,500 StuG IIIs of various types were produced until March 1945 by Alkett and a small number by MIAG. In terms of the resources expended in their construction, the StuG assault guns were extremely cost-effective compared to the heavier German tanks, though in the anti-tank role, it was best used defensively, as the lack of a traversable turret would be a severe disadvantage in the assault role. As the German military situation deteriorated later in the war, more and more StuG guns were constructed in comparison to tanks: an effort to replace losses and bolster defences against the encroaching Allied forces. In 1944, the Finnish Army received 59 StuG III Ausf. Gs from Germany (30 Stu 40 Ausf.G and 29 StuG III Ausf. G) and used them against the Soviet Union. These destroyed at least 87 enemy tanks for a loss of only 8 StuGs (some of these were destroyed by their crews to avoid capture). After the war, they were the main combat vehicles of the Finnish Army until the early 1960s. These StuGs gained the nickname "Sturmi" which can be found in some plastic kit models. Sturmgeschütz III Ausf G, captured from the Syrian Army, in Yad la-Shiryon Museum, Israel. 100 StuG III Ausf. G were delivered to Romania in the autumn of 1943. They were officially known as TAs (or TAs T3 to avoid confusion with TAs T4) in the army inventory. By February 1945, 13 units were still in use with the 2nd Armored Regiment. None of this initial batch survived the end of the war. 31 TAs were on the army inventory in November 1947. Most of them were probably StuG III Ausf. Gs and a small number of Panzer IV/70 (V)s, known as TAs T4s. These TAs were supplied by the Red Army or were damaged units repaired by the Romanian Army. All German equipment was scrapped in 1954 due to the Army's decision to use Soviet armor. 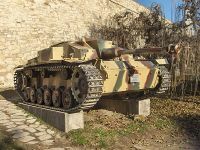 StuG IIIs were also exported to other nations such as Bulgaria, Hungary, Italy, and Spain. Many German Sturmgeschütz IIIs were captured by Yugoslav Partisans. After the war, they were used by the Yugoslav Peoples Army until the 1950s. After the Second World War, the Soviet Union donated some of their captured German vehicles to Syria, which continued to use them, along with other war surplus AFVs (like long-barreled Panzer IVs and T-34/85s), during the fifties and up until the The War over Water against Israel in the mid 60s. By the time of the Six Days War, all of them had been either destroyed, stripped for spare parts, or interred on the Golan Heights as static pillboxes. The 7,5 cm Pak 42 L/70 gun was never developed for the StuG III Ausf G. Such a configuration existed only as a wooden mockup which had a completely redesigned superstructure. One of the StuG III Ausf G's historical modifications, the Schürzen side-armour panels, are missing. Esta página fue modificada por última vez el 25 oct 2016, a las 13:20.